Ami Schreiber is a software developer, but he always dreamed of owning a kosher Chinese restaurant. He grew up in New Jersey, just close enough for his family to be able to head into Manhattan for kosher Chinese food as a special treat. Over the years, Schreiber’s affection for Chinese food grew. 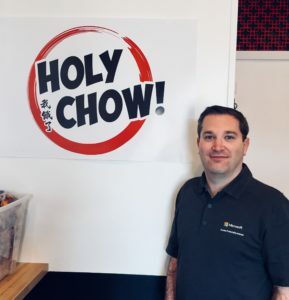 When he moved to the Maryland suburbs in 1999, he continued his pursuit of the cuisine, with visits to the kosher David Chu’s China Bistro in Baltimore and the now-shuttered Royal Dragon in Rockville. When a friend saw a flyer advertising the sale of the non-kosher Chin & Lee Chinese Carry Out in the kosher enclave that is Kemp Mill Shopping Center, Schreiber knew the spot was bashert (meant to be). The shopping center is home to Shalom Kosher Grocery Store, The Kosher Pastry Oven and Ben Yehuda Pizza. There is a synagogue in the parking lot, a yeshiva down the street and three other synagogues and Jewish businesses in the immediate vicinity. Schreiber, an active member of the Kemp Mill Jewish community, knew he needed to jump at this opportunity. He wasn’t a restaurateur, but he had the chutzpah and drive needed to figure it out.